The World, Residences at Sea will welcome acclaimed two Michelin-starred Chef Silvio Nickol aboard this July during the Ship’s call to Amsterdam. 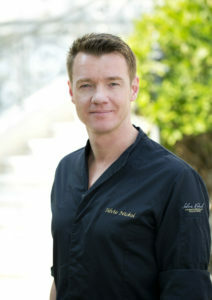 As the latest culinary master to join The World’s Guest Chef Program, Chef Nickol will prepare and host a spectacular multi-course dinner and champagne reception in the Ship’s fine-dining, haute cuisine restaurant, Portraits, one of six dining venues on the largest, privately owned residential yacht on earth. The World circumnavigates the globe every two to three years, calling at an array of destinations famed for their gastronomic flair. Renowned for its delicious and inventive cuisine, The World’s Food & Beverage Team, led by Executive Chef Geoffrey Murray, Beverage Manager Marinela Ivanova and Food & Beverage Manager Saikumar Baddi, will work with Chef Nickol to offer the Ship’s Residents a unique and memorable fine dining experience. The contemporary and ornate dishes will be served by The World’s white-gloved culinary staff. Chef Nickol joins an illustrious group of renowned and innovative chefs who have been invited to cook for The World’s Residents including three Michelin-starred Chef Curtis Duffy, James Beard Foundation Award-winning Chef Michelle Bernstein, Peruvian Chefs James Berckemeyer and Miguel Schiaffino, Indian Chef Vicky Ratnani, James Beard Foundation Award nominee Chef Michel Stroot and famed Sushi Chef Takatoshi Tashito. The Ship has also welcomed more than two dozen wineries, master distillers and notable mixologists. Chef Nickol is Head Chef of his namesake two Michelin star restaurant in Vienna’s historic luxury hotel Palais Coburg, a Relais & Châteaux property. Chef Nickol’s culinary creations – considered some of the most adventurous gastronomy in Vienna – are modern, elaborate, and made from only the finest and freshest produce and ingredients. Chef Nickol has worked at some of the best restaurants in the world including Traube Tonbach and Heinz Winkler, both recipients of three Michelin stars. He opened Palais Coburg in 2011 and earned his Michelin stars there in 2012, an accolade he has maintained to the present day. It was the same year Gault Millau named him “Austria’s Chef of the Year”. In addition to his two Michelin stars, Chef Nickol has also earned four toques and has established himself as a fixed star in Vienna’s world of top gastronomy. He earned two Michelin stars within three years at the luxurious Schloss Velden am Wörthersee.